"But doctor, I am Puddles." The singing YouTube sensation hits the Bing next Thursday. Considering the number of clowns in the world, a precious few come to be popular enough that people know them by name. Bozo. Krusty. Pennywise. Puddles might soon join their ranks, and for many, the statuesque clown with the golden voice is already there. His collaboration with jazzy pop interpreters Postmodern Jukebox on a cover of Lorde's "Royals" has more than 24 million YouTube views, and last year he reached the quarterfinals on America's Got Talent, introducing a massive television audience to his performances of songs ranging from pop hits by Sia, to alt-rock faves by the Pixies, to classic-rock staples like David Bowie's "Space Oddity." 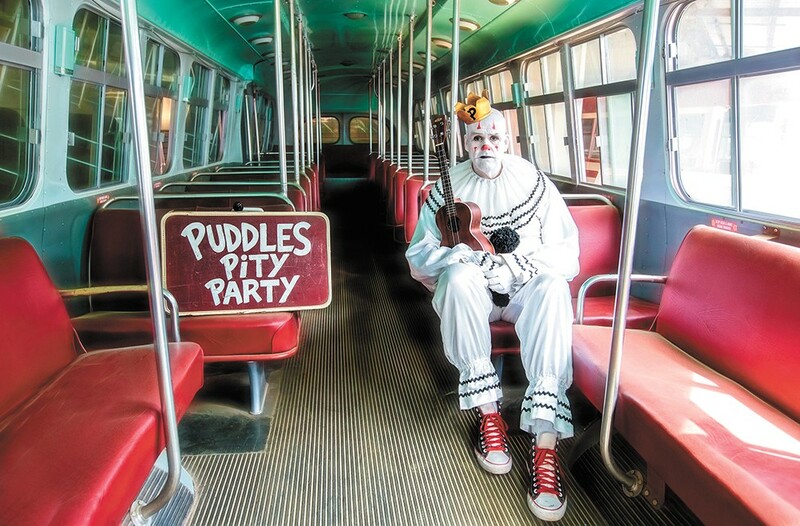 Now the 7-foot clown is bringing his Puddles Pity Party tour to Spokane on Oct. 25. We interviewed the silent, sad jester via email about his inspirations, background and favorite fellow clowns. INLANDER: What appeals to you in a song for you to consider performing it? PUDDLES: It's gotta have the feels. But sometimes the feels are hidden within and I like to find the key to unlock them. It makes me feel like Nicolas Cage in that National Treasure movie. Awesome movie, by the way. Of the songs in your repertoire, is there one you consider your favorite to perform? Is there one that most closely reveals the "real Puddles"? That changes all the time, but at the moment it would be my "Under Pressure"/"Let It Go" smoosh-up. There is a message in there that is really hitting the mark right now. You've obviously had great success collaborating with Postmodern Jukebox. How did that relationship come together? That's a funny story. Scott Bradlee, creator of Postmodern Jukebox, and I were both working through the culinary program at a very established Midwestern teaching hospital some years ago. He was studying to be chef de cuisine and I was not studying at all. While washing up after class, we would sing show tunes, and I would dance and we would laugh. Oh, those were heady days. Not many people know that Scott makes the most incredible galette. That's a French pie. Ah, the French! How has life for Puddles changed since America's Got Talent and some of the viral videos made so many people aware of your talent? The interweb spans every corner of the globe (and beyond, even). My video reach has connected me to all kinds of folks. I've met people from all over the world. And now I'm meeting you! How would you describe what people can expect from a Puddles Pity Party concert? They will see and hear songs, dance around and sing along (if they're so inclined) and enjoy some fellowship! Can you tell me about your earliest days as a clown? What drove you to clowning? Have you had any of the jobs people consider "typical" for clowns, like children's birthday parties or rodeos? I've had almost every kind of job imaginable, and some that you can't imagine. Did you have any favorite clowns when you were growing up? Otto Griebling, Emmet Kelly, Red Skelton, Harold Lloyd, Buster Keaton, Charlie Chaplin, Carol Burnett. Just to name a few. What do you think of other performers who wear full costumes and makeup, a la KISS, Slipknot or Alice Cooper? I don't think it's that unusual. Costumes are like uniforms for the stage. We all wear disguises in one way or another. Don't we? Do you have any advice for people who might be afraid of clowns, and therefore might not think they can handle a Puddles concert? The original print version of this article was headlined "Clowning Around"